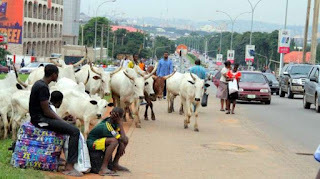 Worried by continuous movement of cows in the City Centre despite several warnings by the Federal Capital Territory authorities, Senate Committee on FCT, has ordered the slaughtering of Cows found in the city centre. The directive was handed down to the Minister of Federal Capital Territory, Alhaji Mohammed Bello when he appeared before the Committee on Monday. Committee Chairman, Senator Dino Melaye, in his address registered Senate’s disappointment at the manner Fulani herdsmen defy the order that they should not move their cows in the capital city, insisting that the Minister must carry out Senate’s position on that. 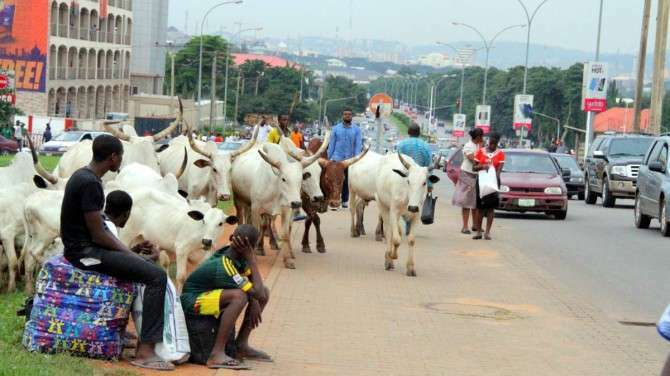 “From now, get knives and ask your men to slaughter cows found in the capital city or prosecute herdsmen seen with cows in the city centre with a fine of N50,000 per cow. This order must be carried out,” Dino said. Dino further revealed that the Senate had received complaints that some residents of the territory were converting their apartments into hotels and brothels, a situation he said was distorting original master plan of the city. He noted that some people were already undermining FCT authority under his watch which he said was unacceptable.